2011 turned out to be one of Monoposto’s biggest ever years, in a number of regards. We had 112 drivers score points in the Championship, with the largest class – Mono Classic 2000 – amassing 30 drivers in its points table. 14 “novice” drivers elected to start their single seater careers with Monoposto in 2012, probably making us the largest route into single seater racing of any UK Championship. 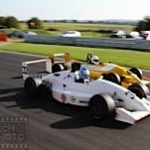 The Club also promoted the largest ever single seater race in the UK; with a combined non-Championship Monoposto and F3 Cup race starting a massive field of 53 cars on the Silverstone Arena GP circuit in September. Watching the launch from the roof of Race Control I can tell you my heart was in my mouth for that one, although I was probably in better nervous shape than Dan Levy when a drive shaft sheared as he dropped the clutch, with 50+ cars all around him…The Club visited 3 circuits which were new experiences for almost everyone: the inaugural race on the new Snetterton 300 track, the Brands GP circuit and Silverstone Arena GP. When the Spa Francorchamps non-championship weekend was included, plus Oulton International and a return to Donington this made for an unparalleled “Grand Prix summer” of racing. But let’s open the faded yellow parchment pages of The Almanake to see what is recorded there for posterity’s delight. Mono 2000 was the domain of Tristan Cliffe, who had an outstanding Championship campaign with 13 wins from 14 starts in the now well-sorted Omicron Dallara F398. Although this was a back-to-back title win the car was noticeably more sorted this year, with Omicron really getting the best out it on most occasions. Tristan started the year with a dramatic recovery drive on the new Snetterton 300 circuit after a first lap spin, passing the entire field and overtaking Matt Draper’s F3 Cup car on the last lap to take the win. Another notable drive came at Brands GP where the track was shared with the F3 Cup cars, and where the red Dallara was clearly on the F3 pace all weekend – it’s probable that this has played a role in persuading Tristan to look towards F3 Cup for 2012. It wasn’t all plain sailing. 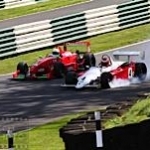 A momentary lapse of concentration at Oulton while in a comfortable lead dropped the car into the barriers at Old Hall. At Donington in the streaming wet the Dallara went onto three but still took the class win, and at the last round at Snetterton the gear change shaft broke in two on the final tour – but held onto the race win anyway. At the end the results table says it all; and a combination of quick driving, excellent car development and focused determination by the whole team produced a year to savour. Second place went to Malcolm Scott in his becoming-familiar black AW Tracksport-run Dallara. As in 2010 Malcolm was a bit distracted by other racing involvements. This year the team made a major effort to support daughter Jennifer’s attack on the F4 title. Despite a maximum attack effort she didn’t get it, but F4 team co-runner Ollie Sirrell did, so it could have been worse! Alongside all this especially in the mid season Mono races Malcolm was really strong, running Tristan very hard indeed at Cadwell, taking up the win at Oulton, and like Tristan Malcolm was on the F3 pace at Brands GP. But right at the end of the year things got difficult for the team at the non-Championship Silverstone event when damage caused to the Dallara by an impact with an errant spinning Jedi took longer than expected to resolve. Malcolm certainly has a title win in him though… The final place on the Mono 2000 Championship Class Podium went to Tony Bishop in the second Omicron Dallara – this being Jeremy Timms car re-fettled after its 2010 season. 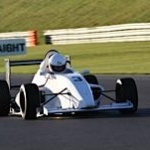 Tony split his time with F3 Cup outings, and had some no-score weekends. At Cadwell he had a coming together with Jim Blockley’s Ralt RT3 plus a major engine failure, at Oulton he very nearly had the definitive Druids “light plane crash” type of accident, and Anglesey was missed altogether due to family commitments. But it was fascinating to see Tony apply himself to the task of getting quicker and more competitive with every outing, eventually deservedly taking the third Championship place by one point from Toni Impieri, and coming within a whisker of his first overall race win at Snetterton, as he could have been the beneficiary of the gear change failure in the leading Omicron car. (A Vettel/Webber analogy? - asst ed.) Not a bad second season at all. Just pipped for third, Toni Impieri did an excellent job in his Formula Renault. He was another driver on a learning curve but once under the wing of the Woodhouse team (and latterly Chris Dittmann Racing) he produced a string of solid results in very competitive company. Several Mono 2000 drivers featured strongly at times during the year, but for a variety of reasons didn’t run a full campaign. Richard Purcell (Topmarx Racing) was prominent in this category, curtailing his season after Oulton just when he was really getting onto it – and with very nearly a win in the wet at Donington to boot. Talking of which Ian Hughes had a one-off birthday outing in Magic Motorsports’ Dallara at Donington and caused a major stir when he used his well known damp-track craft to put the car onto a brilliant pole. Steve Patania went well in one of the Topmarx cars, and Robbie Watts produced an intriguing Lola F3 car which went well at Brands GP but then disappeared from sight. Tony Cotton and Ray Rowan shared the season in Tony’s lovely Dallara, and Chris Woodhouse, Adrian Holey, Graham Read, Julian Cutler, Mark Smith, Nick Anstruther and Kevin Mason all had various outings; Kevin frightening all and sundry with a pit lane fire at Brands when a fuel injection line parted company. 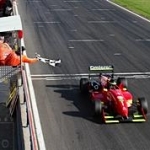 Less endearingly after a good second place at Brands Indy, Kourosh Khani had a second outing in a Formula Renault at Oulton which resulted in his exclusion when a post-race eligibility check revealed the required air intake restrictor, which had been found to be correctly fitted after qualifying, had been removed for the race. However special praise goes to Jeremy Timms for his non-championship outings in a Topmarx Dallara: at Spa and Silverstone Arena GP. 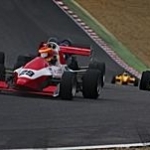 At both events he ran away from the substantial Mono 2000 opposition, and blew the doors off just about everyone except Aaron Steele in the track-sharing F3 Cup field. We all know Jeremy is an expert race driver, but these were sensationally quick performances which gave a lot of the F3 guys real cause for thought, as well as demonstrating just how effective Mono 2000 can be as value-for-money category. Since Jeremy adopted a pic’n’mix approach to racing in 2011, his exploits in several other classes are also commented elsewhere in the Almanake. Mono Classic 2000 is the heartland of Monoposto Racing and had an excellent season, with numbers of competitors in the class which other series would have been happy to have as a total. 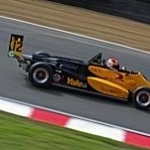 After initial forays in 2010, Peter Venn brought out David Dudley’s gorgeous Anson SA4 for a major attack on the title and was the pace-setter all season; the car resplendent in Yale (Fork Lift Truck) livery. Peter drove a quick and measured Championship title campaign, always at the leading edge of the pace, but making sure he got the points even if the race didn’t quite flow in his direction. Things got a bit tricky at the BritCar Silverstone when the car developed a problem with a rear upright, which eventually prevented running at the last Snetterton event, but by then the title was secured. It was an impressive year’s racing by a combination whose elements; driver, car and team members, could not be more highly regarded. Frankly it says much for the standard of racing in Mono Classic 2000 that anyone was able to beat the Anson, but three people did. 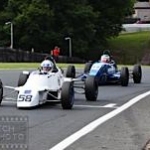 The (and I have to use the word) wily Jim Blockley won at Cadwell in his Ralt RT3. He did have engine problems during the year, but the sight and sound of the Ralt taking Coppice flat without a lift, aero-glued onto the track, was absolutely spine tingling. 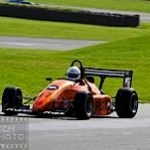 Chris Anstruther also took two wins at Anglesey in the Bowman, one after a real close dice with the Anson, showing a turn of speed that could well produce Championship honours if it’s deployed in 2012. The other 2012 Classic race winner came second in the title race: Kevin Otway won at Brands and had a very strong consistent season which showed that a well driven Vauxhall Lotus remains a force to be reckoned with. He often featured in multi-car disputes but cannily usually emerged first of the bunch to add to his points total. Kevin’s approach to racing is completely drama-free, and this perhaps means he is underestimated by his opponents: which is a mistake as the results show. Even so he was perhaps fortunate to keep the very experienced Francis Phillips in third place. Francis had a very consistent season, being one of a small handful of competitors to score points at every round. But Oulton has been his nemesis in the past and this year it was again – he threw the car off and out of third in the class at the last corner, this one mistake certainly costing second overall in the class Championship. Francis has announced that 2011 was his swan song year, but he’s one of Mono’s most respected and accomplished racers, and everyone is hoping that he can be tempted back…after all it’s such a good calendar for 2012…Behind Francis another FVL, driven by Terry Clarke, also went very well despite a few mechanical problems, dealt with by the ever-cheerful Terry whose best result was a second on a slippery Donington behind Peter Venn. However mention of Donington brings us to the Big Man – Barry Smith – who has shown in the past that he is a Regenmeister. At Donington on a streaming wet track, carrying a rather harsh 10 second “out of grid position” penalty, he won overall; beating all the Dallara’s out of sight, with another outstanding demonstration of wet weather driving. Fantastic. It’s a very big class and The Almanake’s binding isn’t spacious enough to include everyone, but a couple of additional comments are essential. 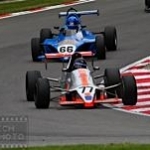 Ollie Sirrell took time off from winning the F4 Championship to take a Mono Classic win at Oulton. Jeremy Timms acquired the use of Nick Catanzaro’s FVL Mk 1 for Snetterton and proceeded to drive the thing ferociously fast, winning the class twice, and nearly taking an overall win as well. Well-known race driver coach Lee Cunningham went very quickly in the Edginton Racing Van Diemen, although he never quite managed a win due to various misfortunes, and Ben Cater was another established competitor to sample Monoposto later on in the year with notable success. The “equal second biggest class” in the Club, Mono 1800 had 24 point scorers during the year. Once again Peter Bragg took his well-tweaked Mygale SJ00 to Championship title honours with a very strong run in the first half of the year in which 5 wins from 8 starts put him in a nearly unassailable position. However after post-race weight problems at Oulton Peter didn’t appear again as a driver, although he did equip the ubiquitous Jeremy Timms with the Mygale for Anglesey. Jeremy promptly won the class twice, and in fact won the second race overall, beating all the bike cars in the wet. It was another virtuoso performance from Jeremy, which also happened to mathematically secure Peter’s title. Behind the Bragg steamroller, Michael Dale put in another impressive and steady season once he had overcome initial car problems to take a very well deserved second place in his familiar smart orange FF2000 Van Diemen. Third place went to Marcus Sheard in a “standard” Zetec Mygale. Marcus also won the SUNBAC Mono Award for the best novice driver in the Championship, with its prize of two free double header entries in 2012. Not only did he produce excellent results in a very competitive class, he was the only one of the 14 novices who competed in every race…so there is crucial message there – you have to be in it to win it! 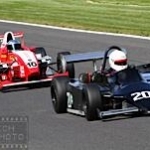 Next up outside the top three comes Olly Thorpe, in a historic FF2000 Royale. Olly’s season was a mirror-image of Peter Bragg’s, as he started racing with Mono at Oulton and bagged three wins and three seconds from the last seven races. He was particularly impressive round the Brands GP circuit. However he needed to win all the seven remaining rounds to overtake Peter Bragg’s total, and his chances of even a podium Championship finish evaporated at Snetterton with a major gearbox malfunction. Other winners in the class were Malcolm Cook – another Regenmeister – in the wet at Donington, and the irrepressible Ewen Sergison at Snetterton. The class abounds with notable performances and interesting stories, and regularly produced excellent upper to mid field dices during the year. Jim Timms gravitated into it when his Mono Classic blew its Zetec engine, only for the Mono 1800 to suffer a similar fate after a good second at Oulton. There was nothing for it but for the Timms team to break the emergency glass and retreave the family Lola Mono 1600 from where Jason had stashed it. Phil Nicholson, running on the very shortest of shoestring budgets, got on track for the last two events and promptly claimed three podiums from four starts. Prajesh Shah persisted with a very recalcitrant Formula Vauxhall 16v in Mono 1800 before finally moving to an 8v version in Mono 1600, where the results immediately started to happen under the new guidance of Chris Dittmann Racing. Many people were impressed by both his application and his ability to get speed out the car - Prajesh is taking the big step up to F3 Cup next year and his progress is going to be keenly watched. Established Mono competitor Matt Hayes introduced his 16 year old son Ryan into Mono racing, with immediately impressive results on the challenging Brands GP circuit – we hope to see much more of this new talent in future in the Championship. And not to be outdone by the newcomers, two of the Club’s long standing competitors both had good seasons, with Jock Sergison and Jonathan Baggott claiming fifth and sixth championship position respectively. Having won the Mono 1600 class championship in 2010 Nigel Davers had clearly set his sights on a repeat in 2011 in the very well sorted Team Fern Racing Van Diemen. His season got off to a shaky start with a DNF in Round 1 due to a minor gremlin, but after that he got the results taking a total of six Championship wins in a very impressive campaign. Major opposition should have come from both Jeremy and Jason Timms, but although Jeremy was super quick in his trusty Van Diemen, the car was unreliable with a variety of problems including the steering wheel coming off in Jeremy hands at Brands. Despite taking a stunning overall race win at Donington in the wet Jeremy then got lured away by the aforementioned Peter Bragg’s Mygale. Jason was also a major threat in the Timms family Lola. The fact he was racing at all was down to an unfortunate accident which had stopped his son competing in motocross. By mid season, after a rather bruising encounter with Nigel and a win at Brands after Jeremy had “not-steered” into the wall while leading Jason was looking like a serious prospect for the title. But…the racing bug had completely bitten and Jason couldn’t resist the opportunity to acquire and race a Speads, so he swapped to the Mono 1000 class of which more anon. With both Timms moving on to new class pastures, this left class stalwart, and previous Champion, Dave Parkinson, as the main opposition to Nigel. Actually Dave was quietly determined to have a real go at the young upstart, and he had a very strong start to the season, but as the year unwound he was thwarted by two separate happenings at Anglesey. First Jim Timms took over the Timms family Lola and proceeded to drive it with some verve, taking a couple of good seconds. At the same time the Parkinson Reynard developed one of those hard-to-trace misfires which only show themselves during races. The fault was eventually traced but by then the damage was done and Nigel had a firm grip on the title which he clinched with an excellent brace of wins at the final Snetterton. Joking aside, Nigel is only in his second season of racing and he has won the class Championship in both years – a pretty impressive record. Third in the class fell to Eddie Guest, also in his second season with the club. Eddie had to miss out on the Brands GP event but otherwise produced a steady steam of results to claim his first Championship podium honours, comfortably ahead of Jason Timms total. As ever there were other notable stories. Mat Jordan joined Team Fern Racing in a nice Formula Vauxhall, and immediately started to make a real impression, eventually finishing runner up in the SUNBAC Nova Awards and taking a couple of satisfying podium race finishes on the legendary Brands GP circuit. He’s taken to racing like a duck to water and should be a man to watch in future. As mentioned before Prajesh Shah moved over to Mono 1600 also with a Formula Vauxhall run by Chris Dittmann racing, and immediately began to show the ability to produce real pace when it was needed. He finished the year on a high and is another to watch as he embarks on F3 in 2012. Joe Venor overcame early season engine problems, plus a start line waltz with Jock Sergison at Cadwell and a quite tricky clip from a 2 litre car at Silverstone, to enjoy his season and resolve to come back for more in 2012. Mono 1400 continued to struggle to find support, with the regulars being Geoff Fern in the TFR JKS and Gary and son Chris Hill in the OMS2000. Both these cars went really well and looked great – fortunately their performance is sufficiently close that the class can be amalgamated with Mono 1000 for 2012 without too many problems. All three drivers had a turn at winning, but Geoff took the class honours by virtue of covering more rounds – as well as some breathtakingly quick and brave driving, which has also netted him the much coverted Spheric Trophy. Mono 1000 was the other class with 24 point scorers, and in 2011 it developed further as a very seriously competitive category, in which both skilful driving and expert engineering were needed to get into the gold. The front runners for the first part of the year were the three Team OFarc drivers, Dax Ward, Marc Fortune and Dan Levy. Initially the main opposition always came from Adrian Wright’s familiar red GEM AW2, but despite a win in the wet at Donington the GEM couldn’t quite hold onto the OFarc Jedis in the dry. But it was more complex than that: there were race winning interventions from Daniel Rowbottom in the Aztec, well supported by James Tanser, and karter James O’Reilly’s Speads which was blindingly quick at Cadwell.. Also the regular front runners had problems. Dax had a couple of engine issues which cost him crucial points, and then Marc was one of five Mono 1000 cars which were controversially excluded at Brands for not being able to demonstrate a working reverse gear. While this sanction was in line with the letter of the 2011 Regulations it’s significant that the Club is seeking to have the reverse gear requirement removed for 2012. But the real change happened from Oulton onwards. Adrian Wright brought out his latest work of genius – the AW3 – and it was immediately quick. At the same time Jason Timms appeared with a very smart black Speads and it was clear that he was going to get to grips with it very soon indeed. The heat was really on, and at the crucial moment it was Marc’s turn to start to experience mechanical niggles which seriously depleted his points total. For the remainder of the season the main jousting for race results was between Adrian Wright and Jason Timms, but Adrian easily had enough in the bag already to take the Championship honours from Jason, with Dax third despite his car’s problems. It was a fabulous and richly deserved result for Adrian – with a self designed, built, run and driven car in a very competitive Championship. Much of the racing was ferociously close but fair. As with 2011 it wasn’t just OK to watch, it was tremendously exciting. Apart from those already mentioned there were several notable appearances. Dan Clowes, always a popular and welcome visitor to Mono 1000, had a good win at Oulton, and a couple of electrifying dices with Scotsman Andrew Dunn at Silverstone, sharing the honours there. Christian Parker debuted the technically fascinating Sewell which very soon proved to be fully competitive. This is certainly a car and driver we’d like to see more of. Stuart Digby managed a couple of competitive outings despite being very busy with work and there were two father and son teams out there as well. Both Mike & Chris Scott’s Speads, and Mike & Jonathan Reed’s Jedi acquitted themselves well. Now all we need is Tim & Arty Cameron back – come on guys, you know you want to…The Woodhouse team ran the very determined John Rawlings who is rapidly gaining experience and pace, and the list of potential winners also saw the return of Steve Cave, who took a couple of events to get to grips with his JKS but then showed some real pace. In 2012 the merged Mono 1000 and 1400 classes will be known as MotoMono, and the class has completely established its position as the premier non-spec category for bike-engined single seaters. The cars are about as quick as an F3 for a fraction of the cost, sound great, look fantastic, and the racing is excellent. More! More! Please! Happy New Year to All Mono Racers! Nigel Davers and David Parkinson – it’s like deja vu of Senna and Prost all over again, but with 1600s. What more can be said of Peter Venn and the Anson SA3?